Are you looking for more cardio in your workouts? 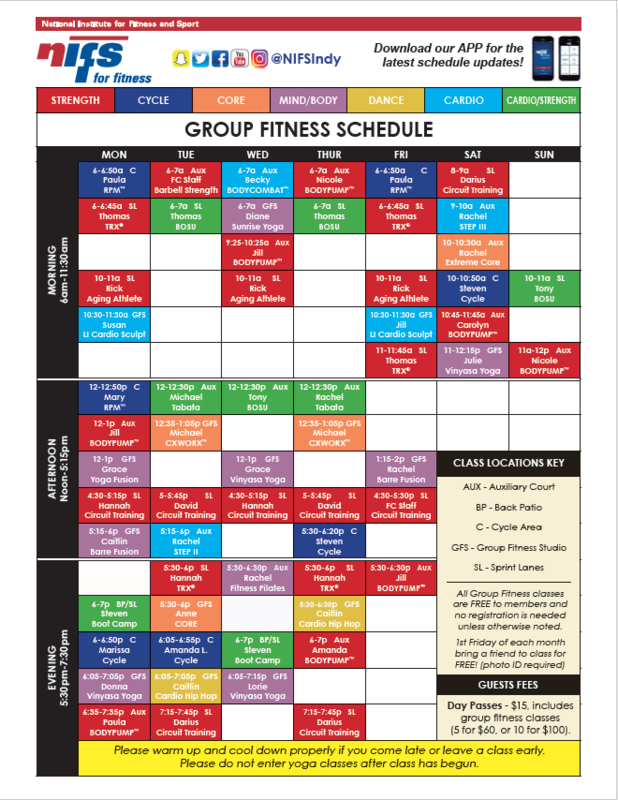 Maybe a class that incorporates weights and strength-training? More interested in Mind/Body classes like Yoga or Pilates? Class descriptions give you an idea of what the main goal of the class is and what to expect. Aging Athlete: This class is geared towards ages 40+. You will work to improve joint mobility and range of motion as well as overall strength and conditioning which are key to performing normal, daily activities. BODYPUMP®: The original barbell workout that strengthens and tones your entire body! Scientifically proven to be the fastest way to lose body fat, you’ll use low weight loads and high repetition movements to burn fat, gain strength and quickly produce lean body muscle conditioning. BOSU: Not only an exercise tool but a complete method of training. BOSU conditioning will challenge and develop every aspect of fitness and increase synergy of the human body. BOSU will focus on strength, stability, mobility, balance and cardio endurance. Try BOSU and experience what you truly are capable of in this challenging, fun and energetic session. Circuit Training: Mix stations of strength training with cardiovascular training for a time-efficient, calorie-burning workout. Low Impact Cardio Sculpt: Whether you are new to exercise or you want to show aging who’s boss, this low impact cardio, strength and balance class will get you moving and keep you moving. workout that has four minute rounds. Exercises range from Strength, Cardio, and Plyometric moves. Get geared up for an awesome workout! TRX®: TRX Suspension Training® is a revolutionary total-body fitness program that uses gravity against the individual’s own body weight to simultaneously develop strength, balance, exibility and core stability. Cycle: This high-energy cardiovascular workout uses various performance levels and speeds to get you cycle fit. Saturday class: This class meets every Saturday except during the week of the 2-Hr. Ride. Try out our 30 min. express version with HIIT Cycle that works with intervals of intensitites to push you to your peak! RPM®: Ride it like you stole it! Take on the terrain with hills, flats, mountain peaks and time trials with this ultimate interval training cycle class. Driven by powerful music, you’ll discover your athlete within and reach new heights! BODYATTACK®: is the sports-inspired cardio workout for building strength and stamina. This high-energy interval training class combines athletic aerobic movements with strength and stabilization exercises. Dynamic instructors and powerful music motivate everyone towards their fitness goals - from the weekend athlete to the hard-core competitor! Learn More. BODYCOMBAT®: Unleash yourself with this fiercely energetic mixed martial arts inspired cardio workout that makes you feel like a fighter. This relentless attack on calories uses mixed martial arts moves like punches, kicks, elbows and knees to strengthen and tone your entire body. No equipment is needed; just bring water, a towel and your inner warrior. Learn More. BODYJAM®: Lose yourself in the dance-inspired cardio workout to the latest dance styles and the hottest new sounds. Each new class will change styles based on what is current and hot. So grab a friend, get front and center and get high on the feeling of dance. Learn More. Step II: Keep your heart pumping with this cardio workout with the step. Intermediate choreography with serious leg training and fun! Step III: Not your momma’s step class! Enjoy fun and challenging choreography to put rhythm in your feet, a smile on your face and sweat on your shirt. and so much more. Many athletes benefit from this format because of it’s flexibility. Using the body as full body resistance. This is a fusion format that moves quickly, powerfully, and creates strength from the transverse abs out. Sunrise Yoga: Awaken your mind and body with this gentle morning yoga class. Yoga 1: Come ready to learn! Prepare for higher-level yoga classes or simply refresh your technique as you spend time learning the names and experiencing the correct positions of yoga poses. Extreme Core: Take your core strength to the extreme using BodyBars and other weighted equipment. CXWORX®: Whether you want washboard abs or to get rid of your muffin top, this class will strengthen your core and glutes. Put this in your workout schedule 2-3 times per week after your strength training and you’ll be doing laundry on your abs in no time. Learn More.